For many years Kia has built cars squarely for the budget conscious buyer. In certain circles, the perception of Kia was their vehicles didn’t have the fit and finish of the well established European manufacturers. Kia, however, have undergone a bit of a transformation and stepped up the game. In particular, the Kia Sorento, their latest crossover is fantastic and offers a great deal of bang for your buck. The all new Kia Sorento is definitely a sharp looking vehicle. Despite being the largest of the Kia fleet, it is actually quite nimble and neat to drive. There is no wallowy vagueness that plagues many cars in this segment. For instance, parking it around town was no harder than parking an average sized estate car. With its 18 inch alloy wheels, large rear spoiler, rear privacy glass, chrome side moulds and full colour coding, the Sorento caught the eye and stood out in the car park melee. There is an individualism evident in the curreny Kia designs, which was definitely lacking in the former ranges. Weighing in at £35k, the Kia Sorrento is at the top end of Kia’s offering. The price may raise an eyebrow. However compare that price with a similar spec Audi Q7 for instance and you soon realise how much value there is with the Sorrento. Especially considering the car comes with a massive 7 year / 100,000 mile warranty. The model I spent the week with comes equipped with auto levelling xenon headlamps, electric folding mirrors and a panoramic roof, of which the front half is a tilt slide. Whilst panoramic rooves have become a must have extra on many current cars, they have one failing. Fixed movement. So it is refreshing to see that Kia have opted for a fully operational opening roof. The electric open/close tailgate revealed massive boot space. Put the seats down, and it soon looked like a cave. The load space was pretty impressive and access was handu due usable to a wide entry space. The third row of seats are hidden under the flat boot space and fold up very easily to create two extra seats; however, in line with most third row seating, its not ideal for average sized adults and when in use the boot space becomes impractically small. Once seated in the front, I found the Kia Sorento a nice height to get in and out of. The 8 way electrically adjustable and heated driver’s seat and manual passenger seat was more than comfortable and offered decent support all round. The steering wheel was easily adjusted into a comfortable position and all of the dash instruments were clear and easy to use. The 8 inch infotainment screen was also easy to navigate. But I did find getting to the farther most left buttons a big stretch from the driver’s seat, as it sat so flat to the dash. With DAB Radio, Bluetooth with streaming ability, USB connectivity, Sat-Nav and reversing camera, there isn’t much more that you would need. With smart entry (aka keyless technology) and a start button on the dash, the 2.2 turbo diesel engine, fired up smoothly and with no clatter. With just shy of 200bhp was far from sluggish on the road despite the realative heavy weight of the Sorento. It pulled well in all gears and over 4-500 miles in the week that I drove the car, averaged around 40mpg on mixed driving with claimed figures of 46.3 achievable. Driving wise the Kia Sorento was pleasing and when pushed into bends gave some body roll, but not in an unexpected and unforgiving way. Visibility on the road was fabulous all round when driving and pretty effortless. What was even more pleasant was the Kia Intelligent All Wheel Drive system, which to my surprise, even had an electronic push button for locking the diff for those times when snow maybe gets a little deeper than expected. With this 4WD system, the Sorento is more than capable of living a country lifestyle. 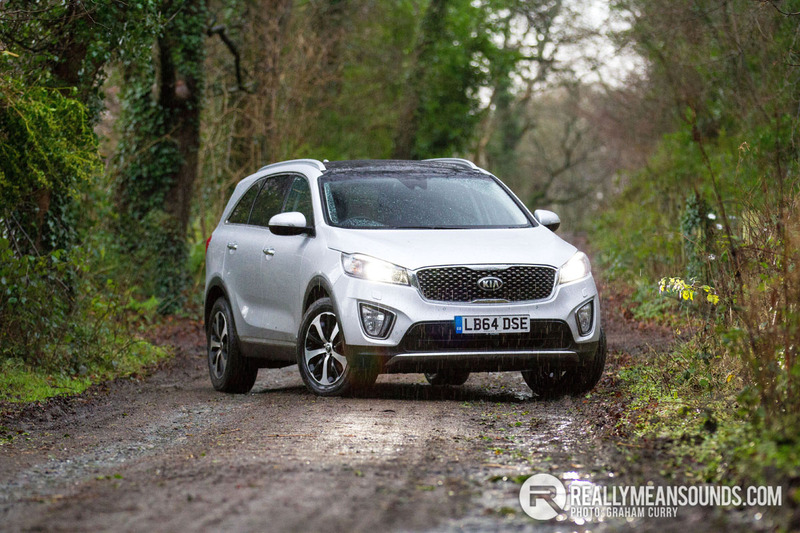 Indeed, on a few of the gravel drives around Ireland Off Road Experience within Clandeboye Estate, the Kia soaked up all of the bumps and undulations with ease. For anyone looking a very affordable seven seater that can cope with a little towing, has the ability to live in the mountains and can do the school run with ease then seriously consider the Sorento. I was mightily impressed with the ability, drive and package that the Kia provided. I work in sales for Downeys Kia in Newtownards, the build quality and features on the Sorento really are fantastic. Majority of customers are torn between this and x5's, q7's, touraegs etc and finding it to be really good value for money. | I work in sales for Downeys Kia in Newtownards, the build quality and features on the Sorento really are fantastic. Majority of customers are torn between this and x5's, q7's, touraegs etc and finding it to be really good value for money. Hope all went well, look forward to reading it! | Hope all went well, look forward to reading it! sister in law got one of these, autobox, drove it from saintfield to city centre and back, brilliant brilliant car. 2 proper seats on the boot too, even decent leg room for a 6'4'' the spec is unreal for price, heated steering wheel everything...for the same money u would get a basic low range model from bigger named brands.